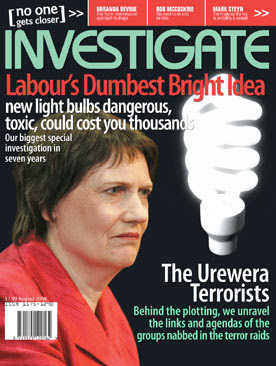 The latest issue of "Investigate" carries a long article on the "Urewera 17" by yours truly. My anarchist friends are not happy. Hmm actually the anarchists up here are rather bemused by the article. I thought it was long winded and didnt really have a point. I was actually hopeing for an interesting read. Anyway I reckon you need a better editor. That said Ian Wishart is always looking for space fillers. Hows the chch Act party going? Thanks for a very revealing and interesting article Trevor. I guess John is a bit close to the action to be able to look objectively at it! It'd be pretty exciting if even half the allegations in that article were true. But when you've got those communist tinted glasses on, a friendship is evidence of a plot, association is conspiracy, and so on. Thanks for an entertaining read of light fiction! Welcome back to the Blogosphere Mr Loudon! And a good start with the piece on the anarchists. What a bunch of losers they are. Idealistic dreamers, the most impossibly Utopian of the Utopians. Is it true that in the civil war in Spain they routinely got massacred because when ordered to attack a sector they would have a vote and usually do something different? As for the Tuhoe: they need a makeover from the nose blowing, spitting, flabby-arsed, half-naked, short mini-Maori we see repeatedly firing an old shotgun into a New Zealand flag. What a marksman! He hits the ground from one foot away. No wonder the British sent only second-line regiments to New Zealand in the land wars. Let the tiny handful of NZ anarchists eat snails I say. NZ would be incredibly vulnerable to a well organised attack group - something like 17N - or even less so like the PIRA. Clearly without taking out any of the Tuhoe terrorists our police force aren't up to the job! If Tame Iti had been serious there would have been 10 dead cops and goodness knows how many hard-working kiwis killed or injured.